Samsung recently announced their new Star Wars POWERbot Robot Vacuum cleaners and now the company has released a couple of videos of these limited edition robot vacs in action. The first video gives us a look at both models of this robot vacuum. The two models are one which is designed to look like Darth Vader, the other model is designed to look like a Stormtrooper. 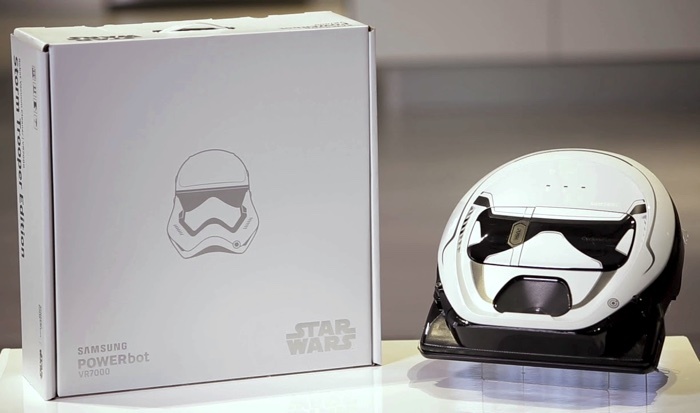 Samsung says that it worked closely with Star Wars fans to create its themed limited edition robot vacuum cleaners. Have a look at the videos of the two different models below. What sets the Star Wars Limited Edition POWERbotTM apart from the original VR7000 is the unforgettable design of the two available models. The Darth Vader edition was crafted from premium materials to closely resemble Sith Lord Darth Vader’s all-black mask, while the Stormtrooper version is a near-perfect replica of the white helmets worn by the ground force of the Galactic Empire. Both models stand ready to rid the galaxy of dirt, and hard to reach spaces under sofas and chairs thanks to its slim 97mm height. You can find out more details about the Star Wars POWERbot robot vacuum cleaners from Samsung over at the company’s website at the link below.